Drivers on Highway 401 in Mississauga, Ont., were forced to navigate around a herd of cattle late Friday and into Saturday after the animals got loose from a transport truck that struck a barrier. The truck driver was hauling the cattle when he hit a guard rail in the westbound lanes approaching Hurontario Street around 11:30 p.m., according to OPP Sgt. Kerry Schmidt. The driver was transported to hospital with what paramedics described as “moderate” injuries. The collision split one side of the trailer, offering a path of escape for about a dozen cows inside. A number of the animals were injured in the crash and had to be put down. 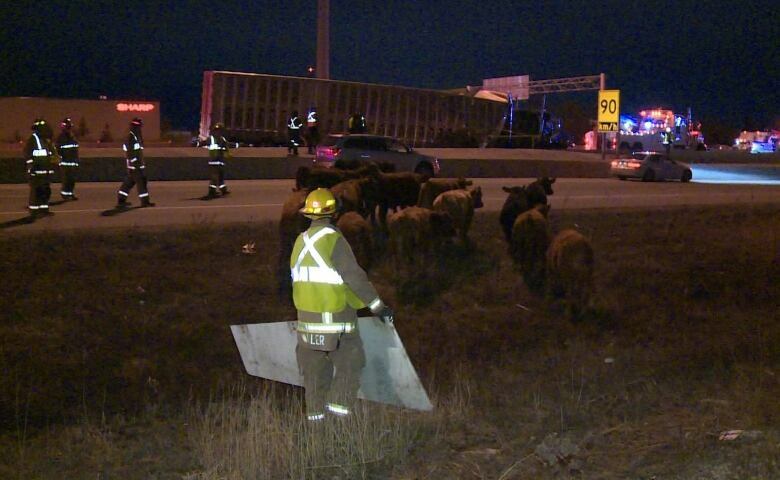 Provincial police were forced to close the express lanes in both directions as officers and firefighters worked for several hours to corral all of the loose cows. The closures lasted nearly seven hours. But there’s no need for drivers to have a cow — the highway has since fully reopened. No, Mueller didn't exonerate Trump. The president's hand-picked lawyers did.